The comedian and TV personality delivered a reading at the mass in Manhattan's biggest arena. He rose to fame thanks to The Daily Show, came out publicly in 2011, and now works as a correspondent for CBS Sunday Morning. Mo Rocca also has a recurring role on The Good Wife and his own show on the Cooking Channel. But the Out100 honoree’s newest claim to fame is that he is the first openly gay man to deliver a reading at a mass officiated by a pope. As MSNBC and other reports showed, Rocca was on the altar, just feet from Pope Francis, when he took the pulpit Friday at Madison Square Garden's Papal Mass in New York, to read from the Old Testament. Rocca made his Colombian mother proud by reading it in Spanish to the thousands of ticketed faithful attending Pope Francis’s first public mass in the United States. Rocca, who hosts My Grandmother's Ravioli on the Cooking Channel tweeted, "I am deeply grateful and humbled to have delivered a reading at a Mass celebrated by [Pope Francis]," following the Mass. And the reaction to his role in the mass lit-up Twitter. Yes @MoRocca reading at @Pontifex mass. Beautiful, too. Glad ppl are seeing ppl in media can be irreverent & believe, too. Pretty awesome to see openly gay @MoRocca, who's mother is Columbian do the first reading for the Mass at MSG with Pope Francis. Seriously, what an amazing statement that the Pope has openly gay Mo Rocca give the first reading. A not-subtle message. Bravo. #MoRocca as lector - see it for what it is, #PopeinNYC love for all people, but not an endorsement of how they live. Rocca was born to a third generation Italian-American father from Leominster, Mass. and a Colombian mother from Bogota, according to the Latin Post, which reported he grew up as the youngest of three children in a loving, bilingual household in Washington, D.C. His mother immigrated to the nation's capital in 1956, when she was 28 years old. 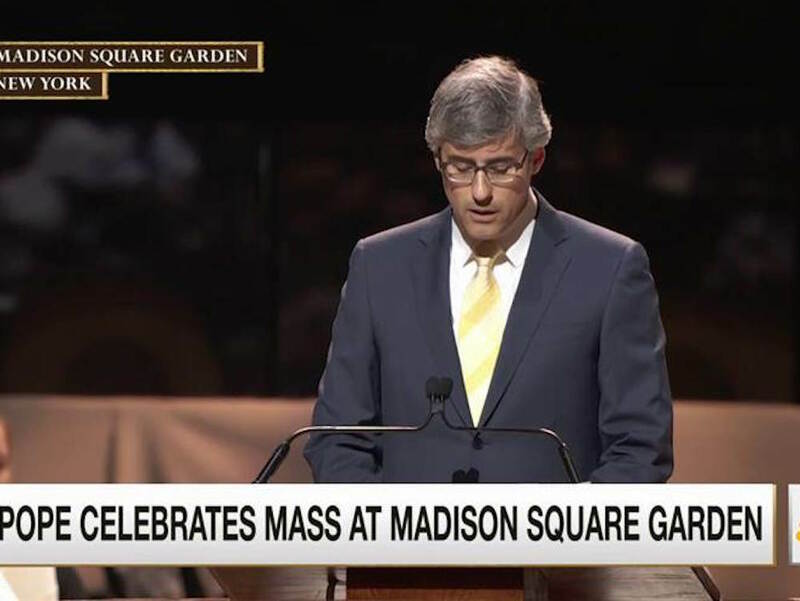 Watch this clip from MSNBC's coverage of Pope Francis's mass at Madison Square Garden, in which Mo Rocca delivered the first reading, below.